A blend of seasoned gluten free breadcrumbs, sage & red onion. Gordon rejects colours, flavours & preservatives and is... gluten free too! 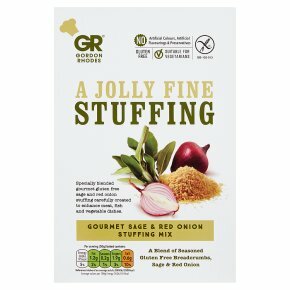 Suitable for vegetarians.Specially blended gourmet gluten free sage and red onion stuffing carefully created to enhance meat, fish and vegetable dishes.